If you are finding out the copper losses in transformer then this article is for you. Here we will see in depth related to copper losses in the transformer. We will also see what is copper losses, calculation of copper losses and how to reduce copper losses in the transformer. There are various types of losses occur in the transformer such as iron losses, copper losses, hysteresis losses, eddy current losses, stray loss, and dielectric losses. Here you will find all related to copper losses. 1 What is copper loss in transformer? 2 How to measure copper loss in transformer? What is copper loss in transformer? Copper loss in transformer is generally defined as the losses occur at the transformer winding. Transformer windings are generally made up of copper material. When current is passed through the winding due to some resistance of winding, some losses occur which is the copper loss of the transformer. The copper loss does not mean losses of copper but it is the loss due to internal winding resistance. Copper loss is a resistive loss which is I2R loss. If the primary winding has copper loss I12R1 and secondary winding has copper loss I22R2. Where I1 is the current in the primary winding of the transformer and I2 is the current in the secondary winding. R1 is the resistance of primary winding and R2 is the resistance of the secondary winding. It is clear that loss is directly proportional to Square of the current ( I). Which means it is directly proportional to load. With the load increase, copper loss in transformer increase. Hence copper loss varies with the variation of load in the transformer. How to measure copper loss in transformer? Copper loss in the transformer is measured by the short-circuit test of transformer. For measuring copper loss first we short-circuit the transformer low voltage side. After the short circuit of LVS, a small voltage is applied on H.V side till rated current flow in L.V side. As in low voltage side maximum current flow through copper winding which is going to measured. In secondary winding, voltage is low so that core loss is negligible so we got lost which is the only copper loss. That’s all by measuring the current passing through secondary winding and resistance of secondary winding we can find the copper loss in the transformer. 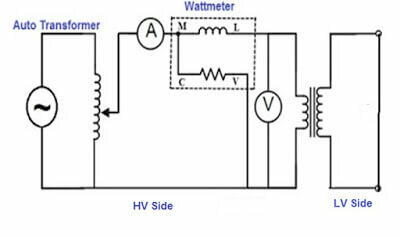 Otherwise, we directly add one wattmeter in low voltage side ( LVS ) which directly indicate copper losses P= I2R. Copper losses are contributing in the reduction of transformer efficiency. So that it is necessary to reduce copper losses up to a certain level. As we saw above, copper loss is the heating or resistive loss I2R in the winding. For reducing losses in the transformer we have to maintain the resistance of transformer winding. Resistance is inversely proportional to the area of the conductor. By the increase in the area of the winding conductor, the resistance of the transformer winding can be minimized. So that losses occur at the winding will reduce. Another technique for minimizing copper loss is Vaccum Pressure Impregnation (VPI). In this technique the transformer is kept in the vacuum then high-pressure varnish is passed so that the smallest of the air gaps are also filled. Hence reducing the copper losses. You can check out the application of transformer. Losses are generally defined as the difference between input and output voltage. In transformer two types of losses possible. mechanical loss and electrical loss. Mechanical losses include windage loss, friction loss etc. The electrical loss is further divided into iron loss or core loss and copper loss. Iron loss or core loss depends upon the magnetic properties of the material used in the transformer core. Core losses include hysteresis loss and eddy current loss. These iron losses we will see in detailed here – iron losses in the transformer. Here we saw copper losses in the transformer. Copper losses are losses in the transformer winding. The copper loss does not means loss of copper but it refers to the loss due to the resistance of transformer copper winding. We also saw how to find the copper losses in the transformer with the equation. Copper losses is a resistive loss or heat loss I2R. Hope you know all the related copper losses happen in the transformer. If you have any question regarding this article then feel free to ask in a comment section. Enjoy!